There was also another one: Watchfulness (“watch and pray”). We did not have time to read “How Shall We Then Blog” but we did finish off with The Bloggers Prayer. Thanks everyone for coming and making it an enjoyable experience. would have liked to have caught your talk, but missed it as I was doing stuff with my kids. Thanks for the synopsis here, but is it worth getting the recording? sorry brodie – it was not recorded. Thanks for the seminar Andrew – very thought-provoking. Having stopped and looked at it I’ve come to the conclusion that your sidebars do line up remarkably well despite your comments! As an avid reader of your blog it was nice to hear you speak and find out who you really are! I often wonder if there’s any point to my blog so i especially liked the point about ‘blogging as praise – public acknowledgement’ Thanks! nice mate. In my blog I have heaped praise on my older, wiser but not so good looking kiwi brother! Really enjoyed the seminar, made me laugh (Pat Robertson idea) and certainly made me think. Thanks for the challenge presented by your outline of Blogging as a Spiritual discipline. On this note, in the latest issue of Wired online John Stewart of the Daily Show said some cool things about use of the Internet in an article interview entitled “Reinventing Television”. Thanks for what you said during the session, there was some good stuff. Speaking to some of my friends who i was camping with, the concept of blogging was a new thing to a lot of them, and at times I was/am not always sure how to justify what I do. But the way in which you brought thoughts together to think about blogging as a spiritual discipline was really helpful. I think/hope it will be helpful to me/them as I continue to share with them why I, and many others, do what we do. And thanks for the link to my blog. Has sent my visitor numbers soaring…. wow – yr blog session sounds a whole lot more in depth than ours (in the Between the Lines venue, a panel I was on, hosted by Nick Page). We had a reasonable crowd, but it didn’t really feel like we got anywhere, essentially. I enjoyed talking about my blog and interacting with comments from the floor, all the same. I would have come to yr session but other commitments meant i couldn’t… do you reckon you’ll be doing a similar thing next year, or will everyone be blogging by then, and know it all?! wish I could have heard it, thanks Andrew. Thanks for a great seminar (and a link). The Athanasius reference really linked up a lot of stuff for me. It encapsulated exactly the way I view the way we need to reflect on what we include when we’re blogging. I really liked the gift economy stuff you said and it has made a group of us rethink a book we’re planning. We’re now thinking of pulishing on a blog as we don’t NEED the tiny bit of money we might get in royalties. The watchfulness idea also touched me. It’s good to know that people out there read with prayerfulness for those writing. Finally – thanks for making me feel not so “sad” for doing the technorati thing – glad there are others out there! Excellent Andrew. I think you’ve managed to be quite definitive as an approach for ‘Christian’ blogging. Andrew, although I’m not myself a blogger (yet), I really enjoyed your thought-provoking seminar. You’re really on the cusp of the future here. Most of all though, I enjoyed meeting the famous TSK – who is, as it turns out, a heck of a nice guy. Yeah… just wanted to echo what others have said really. The seminar verbalised a few things that had been running round my head but also gave me loads to think about, so thanks. Although, I confess, as a blogger but also someone who is pretty rubbish with computers, the parable of the one who tracked back left me in a cold sweat as I understood so little of it! Give me time, I’ll get there. Nice! I will blog this one! Sadder than ever that a domestic crisis meant I missed this…Was hoping that you were going to be at the earlier blogging panel, with maggi, John, Kester et al,- and in the event this was the only bloggy happening I managed this year. Thanks for posting notes from yours; if I’d needed encouragement to keep on blogging, you certainly provide it here. I like how you describe the ‘place’ we’re in when we blog, and many of those categories you mention I also have in mind at different times, when I’m blogging. You will I’m sure have thought of this, and may have touched on it in your session @GB: the question about the actual nature of the place – ie it’s not physical, it’s not corporate – because that affects the way that praise, repentance, fellowship are encountered, that offers a different spirituality perhaps than when we encounter these things in physical places, alongside others….?? 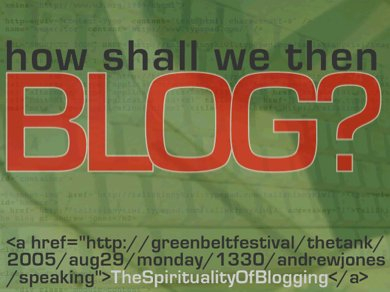 My question upon seeing the blogging stuff in the GB schedule: why are we still talking about blogs? Or, at least, can we ask some new questions? This is also interesting: “‘Christian’ blogging.” Hmmm…do you have to listen to Christian music in a Christian cafe to blog Christian? Wait I bet it’s lack of profanity. I’m fucked then. Insightful as usual… I have a dear friend who just recently started serving in the Dominican Republic. She has been sending out these wonderful emails to share all that is happening, and how to best pray for her/the team and the work the Lord is doing through them. I suggested to her that she start a blog as she said “daily so many amazing things are happening” in explanation to her very long email updates…which I happen to love. As an avid reader of your blog it was nice to hear you speak and find out who you really are! That seems to imply that even such an intense blog as http://tallskinnykiwi.typepad.com/ does not reveal the real man. We have to see him face to face, look him in the eye, hear his voice before we really know him. So a blog is just another front, like our telephone manner and our e-mail style. Is that so? i prefer to have a cup of tea. if the blog spoke for me, i would not have to be travelling one third of my time. that would be nice. but we cant replace turning up in the physical. Going to church can be spiritual. Blogging can be spiritual. Even eating a carrot can be spiritual if done the right way. Anything ban be spiritual if it is engaged with the right state of consciuosness. Religion is used, in part, to explain spirituality, spirituality, in part, is used to explain a transcendance of conciousness. If the consciousness is in the correct state, the experience is spiritual. Previous Post (p)	If Pat Robertson had a blog . . .